WASHINGTON - In March 2018, the Saudi ambassador to Washington summoned a cadre of high-priced Washington lobbyists to his embassy to grapple with a delicate, double-pronged challenge. During an afternoon meeting on March 12, Saudi Ambassador Khalid bin Salman sat at the head of a long table in an embassy conference room, flanked by a whiteboard detailing the prince's itinerary. His assembled advisers included Norm Coleman, a former Minnesota senator; Marc Lampkin, a veteran Capitol Hill adviser who served on President Trump's transition team; and Democratic strategist Alfred Mottur, according to people familiar with the gathering. Eight days after their meeting, the congressional resolution aimed at extracting the United States from what the United Nations labeled "the worst humanitarian crisis in the world" would be defeated - hours after Mohammed was warmly welcomed at the White House at the start of his nationwide tour. The strength of the Saudi operation is now being tested amid a global condemnation of the killing of Washington Post contributing columnist Jamal Khashoggi earlier this month in the Saudi consulate in Istanbul - a death the kingdom belatedly acknowledged last week. Beyond their spending in Washington, the Saudis have enjoyed a priceless advantage: a warm relationship with the president, who has done business with its wealthy citizens, and his son-in-law, Jared Kushner, who developed a close bond with the crown prince as he crafted the administration's Middle East policy. The ties build on a long-standing relationship between past administrations and the Saudi royal family. The kingdom also cultivated opinion leaders through aggressive charm offensives. Powerful government figures - including deputy intelligence chief Maj. Gen. Ahmed al-Assiri, who was fired for Khashoggi’s killing - have visited Washington to court reporters and think tank analysts. The Saudi ambassador regularly hosts intimate dinners in Washington and even occasional galas, such as a lavish event at the Andrew W. Mellon Auditorium honoring this year's visit of the crown prince. The kingdom's lobbying team was dispatched to ensure that leading members of congressional foreign relations panels attended, public filings show. A handful of lobbyists and think tanks have declared they will turn off the Saudi money spigot. Yet to be determined is whether that marks a tipping point in Washington's ties to Saudi Arabia or merely a lull before business returns to normal. "The goodwill the Saudis have enjoyed in Washington, either because of lobbying efforts or their perceived value as an ally, is something to watch in the wake of the Khashoggi incident," said Sen. Mike Lee, a Utah Republican who says Congress has abdicated constitutional responsibilities by supporting the battle in Yemen without declaring war. Coleman - a dean of the Saudi lobby in Washington and an influential GOP figure who also co-founded a super PAC aligned with House Speaker Paul D. Ryan, R-Wis. - said national interests are at stake if the U.S.-Saudi partnership does not endure. "The relationship with Saudi Arabia is critically important, and its partnership in confronting the Iranian threat is critical for U.S. security, for security in the region, including the security of Israel," he said. In the past two years, the Saudis have intensified their efforts to cement the U.S. relationship. The kingdom's spending on U.S. lobbying and consulting, which had dropped from $14.3 million in 2015 to $7.7 million in 2016, surged to $27.3 million last year, according to public records. More than 200 people have registered as agents on behalf of Saudi interests since 2016, according to lobbying documents posted by the Center for Responsive Politics. Among those on the payroll have been some of Washington's top public relations and lobbying shops: the McKeon Group, helmed by Howard P. "Buck" McKeon, the former chairman of the House Armed Services Committee; BGR Group, a firm founded by prominent Republicans Ed Rogers and Haley Barbour; the Glover Park Group, which was launched by Democratic political strategists including Joe Lockhart and Carter Eskew; and the now-defunct Podesta Group, the former firm of Democratic superlobbyist Tony Podesta. Separately, Saudi money - and funds from its close ally, the United Arab Emirates - have also flowed into think tanks throughout Washington, including the Center for Strategic and International Studies, the Brookings Institution and the Middle East Institute. All three said last week that they are ending or reconsidering Saudi grants. "One of the foreign policy truisms force-fed in Washington is that the U.S. and Saudi Arabia have a special, unbreakable relationship," said Sen. Chris Murphy, a Connecticut Democrat and leading critic of the war in Yemen. "At least everybody who is smart and knows about foreign policy who walks into your office tells you that. But as it turns out, a lot of those people are getting gulf money." One of the biggest beneficiaries of Saudi money has been the Middle East Institute, which touts itself as "an unbiased source of information and analysis on this critical region." The organization is chaired by Richard Clarke, who held senior national security positions during the administrations of presidents Ronald Reagan, George H.W. Bush and Bill Clinton. Between 2016 and 2017, the think tank received between $1.25 million and $4 million in funding from Saudi interests, according to its public disclosures. In 2016, MEI received $20 million from UAE - which has backed the Saudi government's claims regarding Khashoggi's death - to renovate its headquarters. The institute also has other ties to the kingdom. Michael Petruzzello - who took on the kingdom as a client after the Sept. 11 terrorist attacks and whose communications firm Qorvis MSLGROUP reported $6.3 million in lobbying fees from the Saudis in 2016 and 2017 - was a member of the MEI board until earlier this year, according to a spokesman for the institute. And Jack Moore, director of the Washington office of the North American subsidiary of the Saudi government-owned oil company, is currently on the board. Scott Zuke, a spokesman for the institute, said that it makes clear to donors that its scholars are independent. "We do not accept any donation from a government, individual, corporation or foundation that seeks to restrict our academic freedom," he said. The pro-Saudi lobby in Washington ramped up its efforts after a major setback in fall 2016 - the success of a bill pushed by the Sept. 11 families, known as Justice Against Sponsors of Terrorism Act (JASTA), which allowed them to sue the Saudi government over its alleged support for the terrorist attacks. Of the 19 hijackers involved in the attacks, 15 were Saudi citizens. In passing the law, Congress overrode Barack Obama's veto for the first time in his presidency, despite arguments by administration officials that the measure could expose U.S. officials to similar lawsuits abroad. "The Saudis are very dirty in their fighting," said Terry Strada, whose husband was killed in the World Trade Center and is one of the lead plaintiffs in the litigation against the kingdom. "Veterans were showing up in Washington using language identical to Saudi talking points. Let's face it, the only people they thought could go up against 9/11 families and be successful were veterans." Some of the veterans were not told that Saudi interests were backing their visit, according to a complaint filed last year with the Justice Department by 9/11 families. The veterans were put up at the Trump International Hotel, one of the president's properties, and the kingdom ultimately paid the $270,000 tab, lobbying records show. "It's an awesome trip and basically like a 5 star vacation :)" read one email invitation filed as part of the complaint. David Casler, a retired Marine sergeant living in Sacramento, said he thought a nonprofit veterans group was paying to fly him to Washington and put him up in the Trump hotel. It wasn't until after he arrived in Washington that he figured out the Saudis were paying the bill, he said. "We realized we were pawns," Casler said. Petruzzello, who helped organize the veterans' campaign, did not return request for comment. He told Yahoo News last year that his firm followed lobbying laws, adding that allegations that veterans were deceived "rings hollow to me." As the Republican presidential nominee, Trump called Obama's veto of JASTA "shameful" and "one of the low points of his presidency." A few months after Trump's inauguration, Kushner and Mohammed met in person for the first time at a lunch in the White House's regal State Dining Room. They immediately hit it off, conducting so many one-on-one phone calls in the following weeks that some intelligence officials raised concerns that Kushner was freelancing diplomacy, The Post previously reported. In the days preceding and after the prince's visit, the embassy's @ArabiaNow Twitter feed - run by Qorvis MSLGROUP, according to lobbying records - offered a sunny view of the oil-rich kingdom and its role in Yemen. On March 10, 2017, @ArabiaNow tweeted, "Saudi Arabia steps up its assistance to care for ill and injured in Yemen," linking to a post detailing Saudi-led humanitarian assistance - claims that human rights activists dismiss as propaganda. Around the same time, one of Mohammed's rivals was seeking his own gateway to the administration. In May 2017, the Saudi Ministry of Interior - at the time headed by Mohammed bin Nayef, then next in line for the throne - paid $5.4 million to a firm led by a Trump campaign adviser and Oregon winery owner named Robert Stryk, according to public filings. 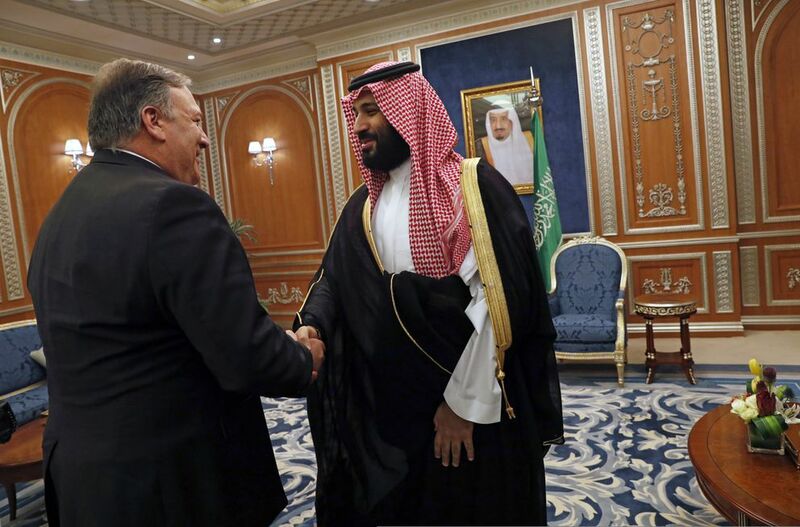 Just one month later, when Mohammed was elevated by King Salman over Nayef, the deal abruptly ended due to "regime change in Saudi Arabia," according to lobbying documents Stryk filed. Stryk declined to comment. White House officials declined to comment except to refer to an interview Trump gave The Post on Saturday, in which he played down Kushner's relationship with the crown prince. 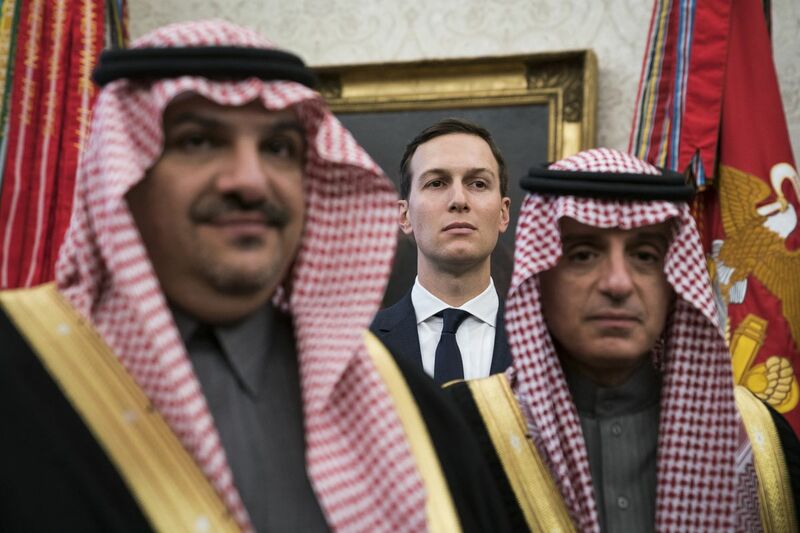 "Jared doesn't do business with Saudi Arabia They're two young guys. Jared doesn't know him well or anything," the president said. "They are just two young people. They are the same age. They like each other I believe." The crown prince was not the only Saudi official making the rounds in Washington. In town the same week was Assiri - the Saudi intelligence official late fired over Khashoggi's killing - who told reporters that the Trump administration had pledged to increase U.S. intelligence sharing and defense cooperation. Days later, Assiri wrote an op-ed published on FoxNews.com that hailed the importance of the U.S.-Saudi partnership in fighting terrorism. Assiri’s piece was entered into the congressional record by Rep. Edward Royce of California, the Republican chairman of the House Foreign Relations Committee. Royce praised "General Assiri's support for intelligence sharing" and noted that "the relationship between the United States and Saudi Arabia is central to the fight against terror," according to the congressional record. In March, facing the prince's upcoming visit and the Yemen vote, the Saudis' Washington machine whirred into action. Coleman described the meeting as a routine planning session. Mottur confirmed he and Lampkin were in attendance on behalf of their firm Brownstein Hyatt Farber Schreck. Lampkin did not return a request for comment. During the seven weeks leading up to the crown prince's visit and Yemen resolution vote, lobbyists reported 759 contacts with members of Congress, staffers, academics and reporters on behalf of the Saudi government, according to public records. "People seem to have a hard time believing their eyes in Yemen," said Murphy, a critic of the air war. "The Saudis are clearly bombing civilian targets over and over, and people don't want to believe it, which tells you how powerful their relationships are in Washington." The day of the March 20 vote, Defense Secretary Jim Mattis made a rare appearance at lunches for both the Democratic and Republican caucuses in the Senate, according to staffers, appealing to Congress not to pass the resolution. "They called out the big guns," said one top Senate aide. The resolution failed to advance, 44-55. The same day, the Saudi crown prince arrived in Washington, kicking off a three-week public relations blitz in which he met with entertainment mogul Oprah Winfrey, Microsoft founder Bill Gates and Amazon CEO Jeff Bezos, who owns The Washington Post. His arrival was greeted with a piece on the website of the Middle East Institute by Fahad Nazer, identified as a guest contributor, who wrote: "The U.S. and the West should take note of the fundamental social changes taking place in Saudi Arabia and support Crown Prince Mohammed." A link from Nazer's name goes to a short biography describing him as a "a columnist for the Saudi daily newspaper Arab News and a political consultant to the Embassy of Saudi Arabia in Washington." "The views he expresses are strictly his own," it says. "For think tanks, as well as universities and museums, taking Saudi money is going to leave a stain for some time to come," said Daniel Benjamin, director of the John Sloan Dickey Center at Dartmouth University, who has worked at Brookings and the Center for Strategic and International Studies. "We still believe that the United States has an interest in sustaining the bilateral relationship with Saudi Arabia," said CSIS spokesman H. Andrew Schwartz in an email. "Most of what the U.S. wants to achieve in the Middle East becomes more difficult in the absence of such a relationship. But at this time, given the circumstances surrounding Mr. Khashoggi's killing, CSIS has decided to reassess its own relationship with the Kingdom." Similarly, the Brookings Institution told BuzzFeed last week it was terminating the only research grant it had from the Saudis - a six-figure sum "to provide an analysis and evaluation of the Saudi think tank sector." The Middle East Institute last week called on the Saudi authorities "to act swiftly to bring out the truth about what happened to Mr. Khashoggi and to hold accountable those responsible." The think tank said it would decline Saudi funding - but "keep the matter under active review pending the outcome of the investigation." The Washington Post’s Emma Brown, Alice Crites, Karoun Demirjian and Missy Ryan contributed to this report.